187 in stock Need More ? Join Topsy and Tim on a new adventure as they meet Father Christmas in this Ladybird festive stocking-filler, the ideal gift for your little one. Topsy and Tim are just like you! Their adventures are the perfect stories to reassure young children as they go through similar experiences themselves. In Topsy and Tim Meet Father Christmas the family are off to the local garden centre to choose a Christmas tree, and while they are there the twins meet a very special person. Inside Santa's Grotto is none other than Father Christmas himself! 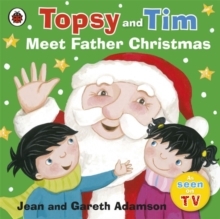 Topsy and Tim promise that they have been good all year, so Father Christmas gives them both a special present to take home. A trusted and well-loved pair who can help guide parents and children through 'first experiences', the Topsy and Tim stories have been beautifully updated with contemporary artwork. Topsy & Tim remain instantly recognisable to parents while in a fresh style that will appeal to a new generation of fans.